Samsung has hit LG with another lawsuit, this time for purportedly infringing on LCD patents. Filed with the Seoul Central District Court, the complaint aims to invalidate seven LG patents that allegedly copy a plane-to-line switching (PLS) design that Samsung patented in 1997. Samsung claims that LG modified and renamed the PLS technology to AH-IPS for use in various small and medium LCD panels. 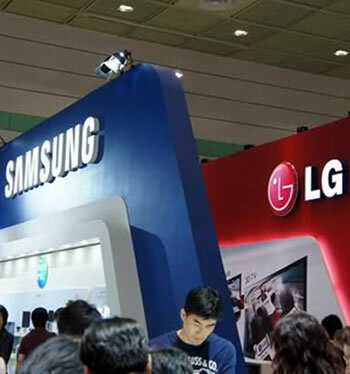 Naturally, Samsung wants a sales ban on LG products with the infringing technology, which would include devices such as the Optimus G and Optimus Vu 2 smartphones. It's worth noting that Korea Times believes such an injunction is unlikely. Samsung also seeks damages of 2 billion won (roughly $1.9 million), though an unnamed senior executive said the dispute is more about pride than money. In September, LG sued Samsung for allegedly infringing seven OLED patents. Samsung fired back in November, filing a lawsuit to invalidate the aforementioned LG OLED patents, claiming that they lacked innovation. That scuffle followed the arrest of 11 Samsung employees accused of stealing and leaking confidential information to LG about Samsung's upcoming big screen AMOLED televisions. The latest suit comes as Samsung looks to reduce its spending on LCD panels and invest further in OLED technology. In a separate Korea Times report, a company representative said LCDs are approaching full saturation and are no longer a cash generator. It was noted that major TV markets such as the US have been more sluggish than expected, while demand for devices such as tablets is booming, so that's where the company plans to focus its efforts. Of the 7.8 trillion won Samsung will reportedly invest in displays next year, only 1.8 trillion will be allocated to LCDs. The company is expected to ship a Galaxy Note III device with a 6.3-inch OLED screen early next year along with 55-inch OLED TVs later in 2013.